This project model is the result of a month long process of research, design, drawing, and modeling. The project prompted us to design an effective solution for a border wall community resource facility. The building requested was to be placed directly onto one of Trump's border wall designs and include multiple connective elements including digital, virtual and physical connection through the wall. The goal was to create a building that gave people living in the borderlands between the United States and Mexico a place to go where they can have access to internet, a place to work or study, have a business meeting or make long distance or international phone or video calls. 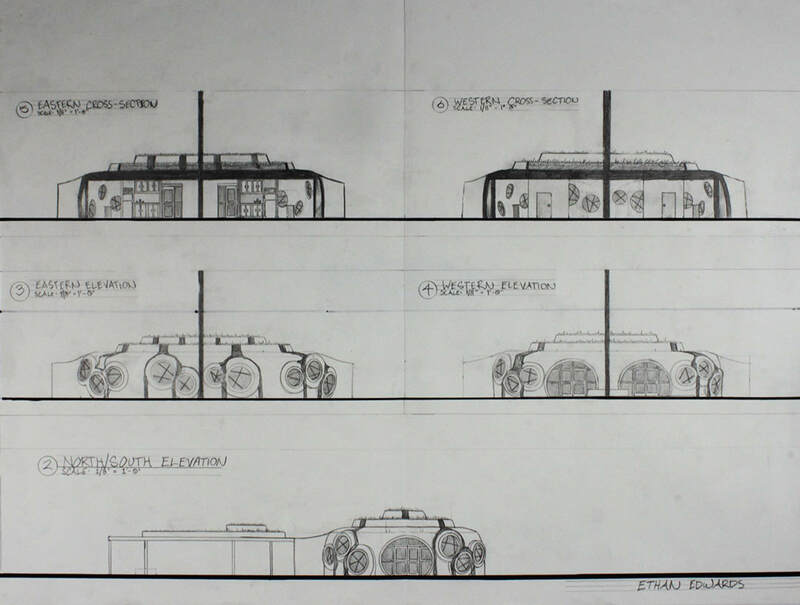 These Preliminary drawings include that of multiple concepts and designs that were ultimately molded into the building I finished with. These include concepts of the floor plan and look of the building. 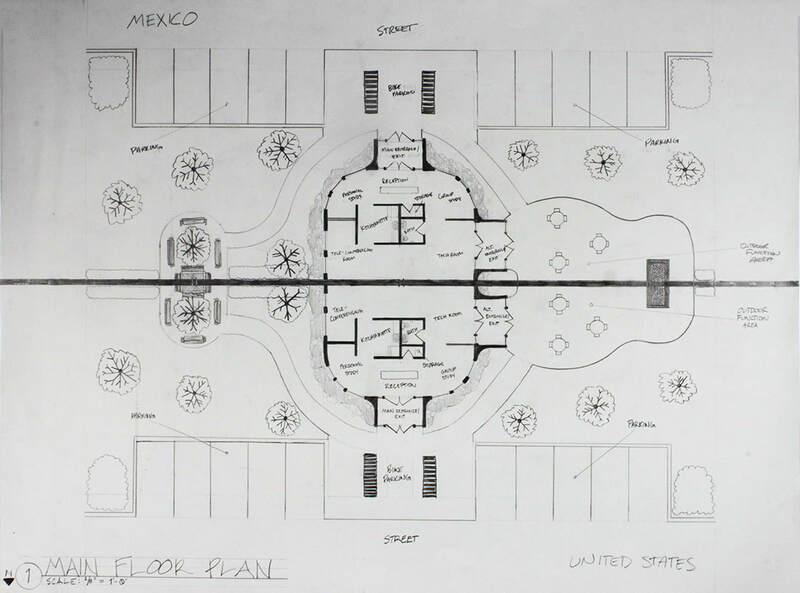 Main floor plan + site plan in one drawing. Spaces are labeled, everything is hand drawn to 1/8" = 1' scale. This is a collection of images taken of the final completed model of the site and building. ​I was asked to provide a resource, and I answered with what is encouraged in this class: a creative and unique solution to the problem at hand. My solution caters to all of the needs of the users of the building, and stands out compared to other structures in the area. Its tropical look, composed of the earthen material used to construct the exterior walls​, the greenery growing on the terraced roof and the water trickling down the sides and around the windows, creates an inviting feeling when you look at it. It communicates that it is a location of life and growth, and it competes against the industrial look of the border wall with its organic look and shapes. When I designed this, I wanted to create one building that happened to be separated by a barrier, and It functions as that as well rather than two buildings on either side. There are multiple design choices and landscaping decisions that were made during the development and designing of this building that all contribute to the self maintenance and sustainability of the building. By having a "buffer zone" at every entrance and exit where people must pass through two doors in order to enter or exit, we keep less heat from entering the building (and less cold from escaping) when doors are opened. This element cools the top and sides of the building. 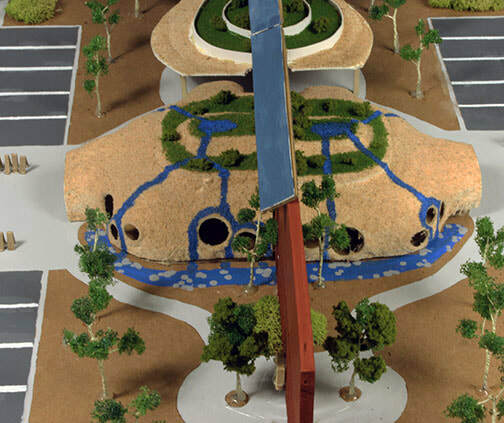 A fountain would be placed on the roof and circulate water from the creek around the building back up to the top so it can flow down again. The Point of having this in the design and having it be placed all around the exterior of the building is that when the water is heated by the sun, it evaporates and as a result cools the air around the building and the walls of the building, keeping less heat from entering through windows. This absorbs sunlight and with the water flowing through the plants on the roof keeps it cool and wet, keeping the building cool. The solar panels for the building were placed on top of the border wall, facing south and angled downwards in order to get the most sunlight to convert into energy for the building. A research project studying life and issues on both sides of the United States-Mexico border. 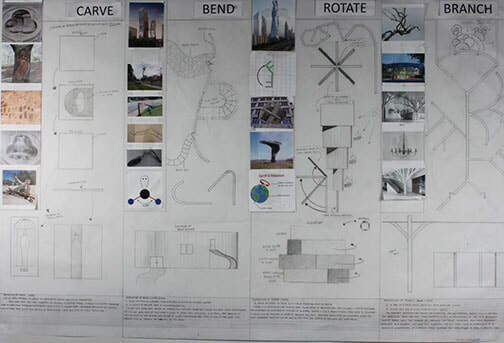 A research project studying different architectural verbs and how they can be used and interpreted.